If you think you dog would be good doing dog show events like basic dog obedience training events, check out the Canine Good Citizen award. It offers easy to teach basic lessons. You can train him yourself or take a class. Before he takes the test, you sign a Responsible Dog Owners Pledge stating you'll care for your poodle's health, safety, exercise and training needs. The test tests how your poodle obeys and interacts and your ability to handle him. Your dog must let the tester approach, sit while he pets him then brushes him, walk him, and walk past people without jumping. Your pet must sit, lay down, come when called, not be aggressive to other dogs, not be distracted easily and be calm when he can't see you. All this takes 10 minutes! A male cannot be neutered and a female cannot be spayed. Why? 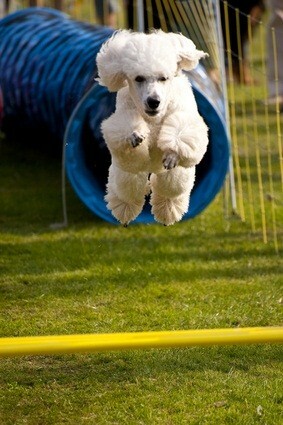 Because dog shows showcase which poodles are champions and worthy of breeding. To get your poodle in conformation shows, he must be in good condition and fit breed standard. You can take handling classes and get him to the groomer's for the right clip. Puppies under 1 year old can be shown in a puppy clip, older dogs need a English saddle or continental clip. The hair for show clips is longer than a pet poodle's coat. If you want to show your poodle yourself, you'll have to learn how to groom her. You can hire a professional handler if you don't want to show her. Contact your local kennel club to sign up for handling classes. Or contact a handler you like from a dog show and see if he offers classes or is seeking volunteers at dog shows. In American Kennel Club (AKC) shows, your poodle needs at least 15 points, and 2 majors under separate judges, to be a Champion. Up to 5 points can be earned per show. The more dogs your dog wins over, the more points he gets. Majors are 3, 4 and 5 point wins and are determined by the number of dogs in that show. There are 5 regular classes with different requirements your dog can enter. The judge picks male winners and then female winners then picks 1 dog from these dogs who gets points towards championship. The Puppy Class is separated into 6 to 9 months of age and 9 to 12 months of age. The Novice Class is for poodles that have never won 1st prizes and don't have any points towards a champion title. The Bred by Exhibitor Class is for pets handled by their breeders or the breeder's family, the American Bred Class is for dogs bred in the U.S., and the Open Class is for dogs that aren't champions. Males and females never compete against each other. Poodles first compete among their breed. The winning female and male dogs go to the ring with the champions, this is the Best of Breed. The Best of Breed winner goes on to compete with other dogs in its group. 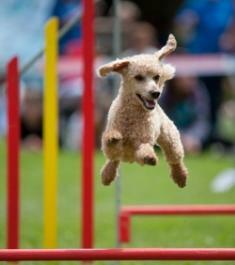 Toy poodles are in the toy group, minis and standards are in the non-sporting group. Each group winner goes on to the Best of Show where one dog will win. Rally events are competitive but less structured than obedience events. You and your pet go to different stations where you perform the exercises written on a card. You need 70 points to qualify. You're allowed to talk to your poodle, use hand signals and give commands but you can't touch him. Rally novice has 10 - 15 stations, Rally advanced 12 - 17 stations and Rally excellent 15 - 20 stations. Rally novice uses a lead for the exercises, the others do not. National dog show events are a nice bonding experience for the owner and poodle. 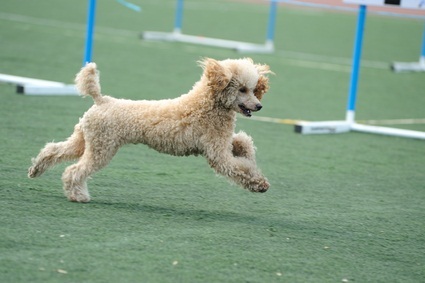 Poodles learn quickly and exercise events can be fun for the dog as she learns new things.